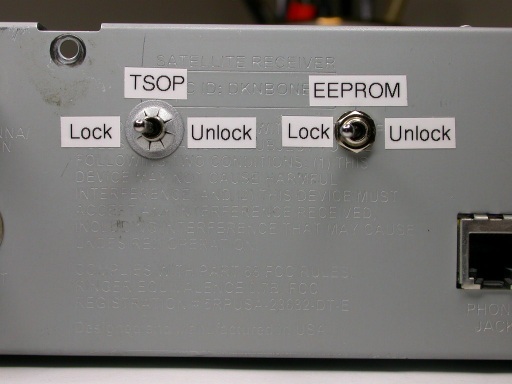 I have included instructions to implement an EEPROM lock at the same time. 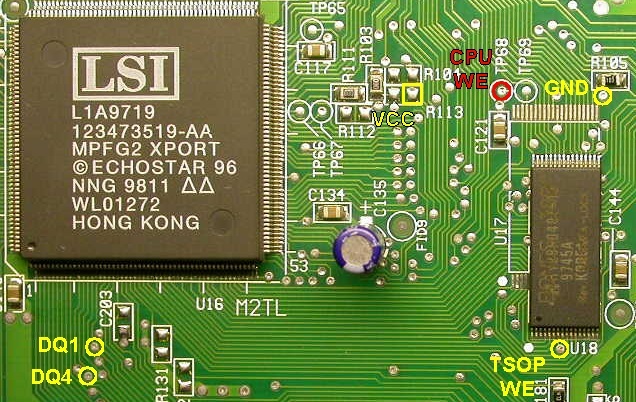 Remember: Model 1000 receivers DO NOT HAVE A JTAG interface. 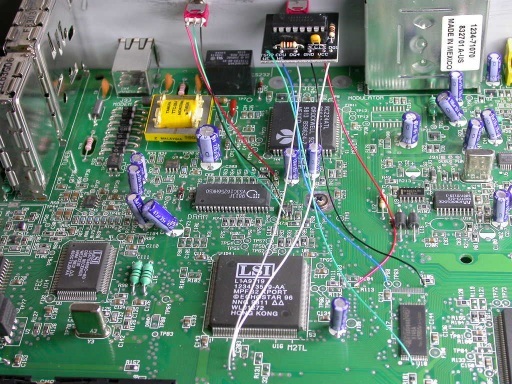 If your receiver gets ECM'ed, the ONLY way to fix it is to unsolder the TSOP and/or EEPROM and reprogram it with an expensive chip programmer. 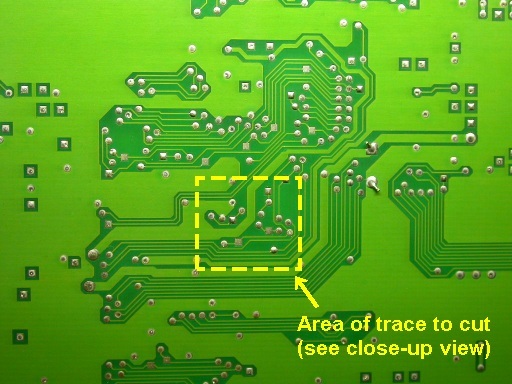 In order to remove the mainboard from the chassis, you must also remove the locknuts from the coaxial connectors that fastens the mainboard to the backpanel of the receiver. Remove nuts from receiver backpanel. Use a tape measure or ruler to take measurements and mark the center of the holes to drill with a felt marker. Drill 2 3/16" holes. 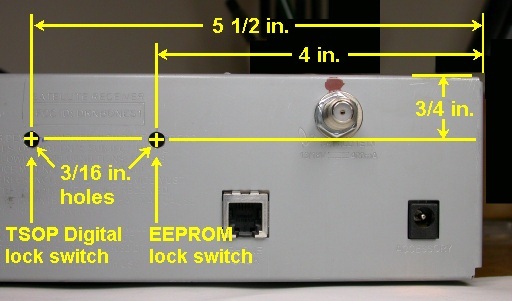 The first is 4 inches from the right-hand side of the receiver case and 3/4 inch from the top. 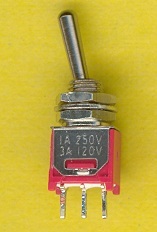 The second is at the same height and 5 1/2 inches from the right-hand side of the receiver case (1 1/2 inch to the left of the first hole) as shown in the picture below. 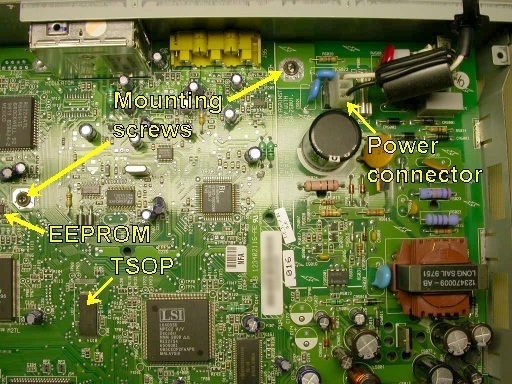 Note where the the TSOP is located (refer to first picture above). 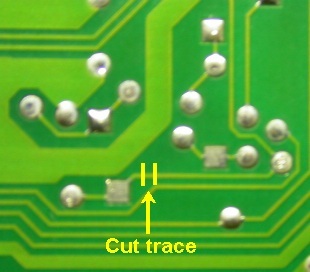 Flip the mainboard and locate the trace to cut on the bottom side. Use the pictures below as a guide. 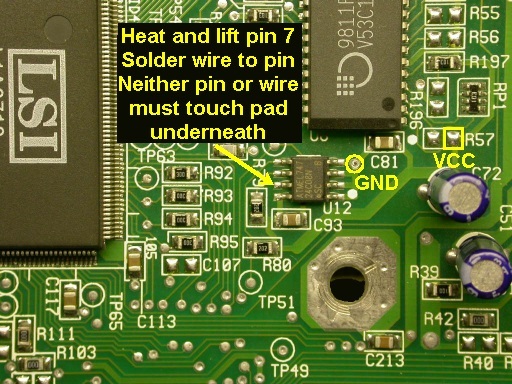 Use the picture below as a guide to solder the wires coming from the digital lock board to the right locations on the mainboard.